I’ve just come back from a visit to Sydney sandwiched with a short road trip along some of the coast north of the city. 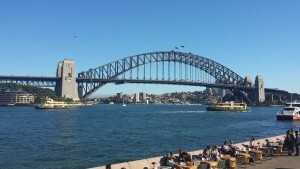 If you’re a regular visitor to this blog you’ll know that Sydney is my favourite city to visit. It has the spectacular Opera House and Harbour Bridge, and is built on a beautiful harbour. A ferry trip anywhere from Circular Quay gives you stunning views. The city has some beautiful architecture in its older government and cultural buildings, as well as fabulous parks and gardens. I absolutely love visiting Sydney. One of my favourite pastimes is taking a ferry trip to Manly, not least because you have the best views of the harbour bridge and Opera House. 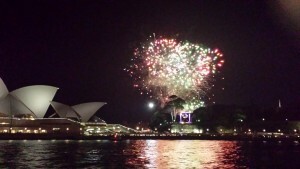 On our last evening we took a ferry ride to Manly. It was a lovely warm evening and so we were outside on deck on the trip back to the city. 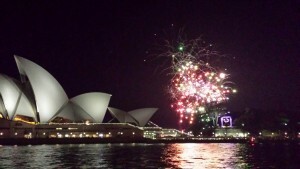 As the ferry reached the promontory with the Opera House everyone pulled out their cameras and phones to take photos. It doesn’t seem to matter how many photos you have of this amazing building, there’s always a reason to add a few more. 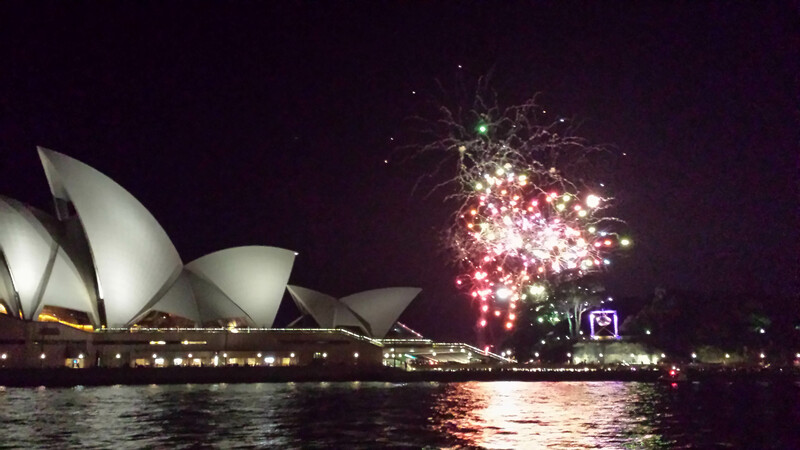 Just as we were snapping away, there was a blaze of fireworks for about two minutes, what brilliant timing! When I was younger, I used to wonder why people would visit the same place year after year, I couldn’t imagine anything more boring. To be honest, I still wouldn’t want exactly the same holiday every year. I guess one of the delights of visiting Sydney is that it’s usually a long weekend visit and so doesn’t really count as a holiday! However, there are pleasures in revisiting a favourite restaurant or café and in seeing sights and views that continue to inspire and amaze you. On a different note, although there is a connection, I have just about finished the first draft of my latest novel. I still have a few scenes to write, but the main story is finished. Editing is an interesting process, and very different from writing the first draft. Before I start to write a novel, the characters have lived in my head for several months, sometimes a year, so I already know them pretty well. Once the first draft is finished, I know them even better. I’ve been with them during an event or two that sends their life into a crisis they never imagined, and through mounting problems and challenges that bring them to despair. The editing process is a little like going to a destination you’ve visited before. There are places you love and want to see again, but also new things to discover. With the main characters in a novel, there are personality traits and characteristics you already know and show in the writing, but there are also deeper qualities and attributes you need to explore or even discover to make sense of the things they do. For a character to be well-rounded and real, there has to be understandable reasons for the things they do, otherwise they appear two-dimensional. This is especially true of the villain or nasty character. Very few people wake up in the morning and think, today I’m going to be horrible and make everyone miserable. There is a reason they act like that, or at least in a book there needs to be a reason so the character is realistic. Think about the most memorable evil or unlikeable characters in novels you’ve read. Something has happened to shape them, and sometimes even make us feel sympathy for them, even if we don’t like them. Currently I’m looking at the early life of one of my less-likeable characters to figure out what made him like this. As authors, we put our characters through hell, and I wouldn’t have it any other way!